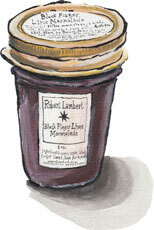 Finger Lime Marmalade for sale. Buy online at Zingerman's Mail Order. Gourmet Gifts. Food Gifts. The finger lime, native to Australia, looks nothing like the round green baubles we know here. About the length and shape of a pinky finger, the thin peel holds tiny pink pearls of fruit inside. They spill out like caviar when you tear the green-black peel and taste more floral and less sour than any other lime you’re tried in your life. Master preserve maker Robert Lambert (our source for all sorts of sweet treats from fruitcakes to caramel sauce to syrups) combines this ultra rare citrus with cane sugar and lime juice to create a redolent marmalade with depth and complexity. A rare and wonderful experience for marmalade lovers everywhere.